By default, no signature is appended to messages you send (or reply to) from Rackspace Mail, the hosting company's webmail client. But it does support signatures: I'll show you how to create one, and how to update it after the fact. 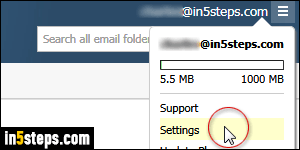 First, log into your email account and click on the "hamburger" menu icon in the top right corner of the window, and choose Settings from the dropdown. 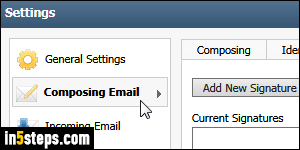 When the Settings dialog pops up, select the Composing Email options on the left. Then, click on the Signatures sub-tab on the right. To create a new signature, click on the Add New Signature button. To change an existing signature, you'd select it in the listing, and click on the Edit button. Start by giving a descriptive name to your signature (useful if you use multiple signatures depending on whom you email). 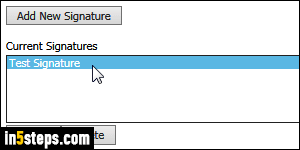 Then, click inside the text box: by default, a "text-only" signature will be created. 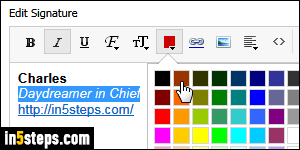 If you want to add formatting like bold and italics, colors, and insert links or images -like a company logo- in your signature, click on the "Enable Formatting" link on the right. Otherwise, the formatting toolbar's buttons are disabled (grayed out) until you do. Once you've added or edited your name, title, website, phone / fax, and other contact information, click on the OK button to save your change. If you created a new signature, it will now appear in the listing under the name you picked. 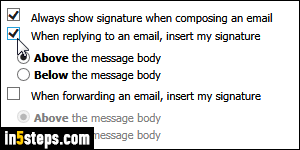 - Check "Always show signature when composing an email" to include it automatically. Otherwise, you can manually insert it from the dropdown. 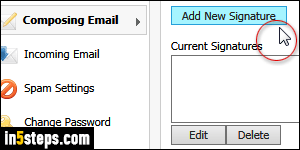 - Check "When replying to an email, insert my signature" to show it not just for new messages. Notice that you can pick where it appears in that case. - Check "When forwarding an email, insert my signature" to include it then.